Stuart and I headed to Mentone early in the afternoon to check out the south easterly. On arrival, the wind looked OK but not strong. Once on the water we had a ball! 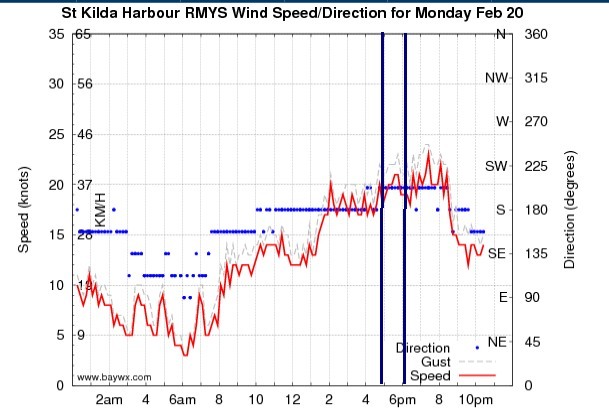 The wind was around 15 knots and quite smooth. The water was warm and clean. And we had the place to ourselves. Sweet! Stuart was focusing on more aerial tricks, while I took out the Sector 60 again to keep practising gybes. The Sector 60 was well powered by the Noise 12m kite, so much so that I depowered the kite for most of the session. I completed several "right turn" gybes successfully, but still think I need to speed up the foot switch and do it a bit earlier. I am still amazed by how much speed, power and upwind ability I get using the Sector 60 in lighter winds. I completed only one "left turn" gybe, but was feeling more confident riding toeside on the left tack. Pushing the bar out during the turn helps regulate the kite and board speed too. I tested out the Contour Surf Mount (the old model) I had just fitted to the Sector 60 board. I found it tended to flop down as the board gets whacked by waves and chop under speed. The thumb screw for tightening it is hard to do up tight. Also, the waterproof housing slides around in the mount. Contour are not selling this original surf mount and have replaced it with a new model - I suspect its function will be improved. I did get some interesting shots however. I have occasionally encountered some Jetski riders while out kitesurfing in Port Phillip Bay. None have come very close to me so far. While kiting at Frankston recently one Jetski rider was in the water for a while. I kited past and asked him if he was OK - he said he was. The other Jetskis nearby kept well away from me. 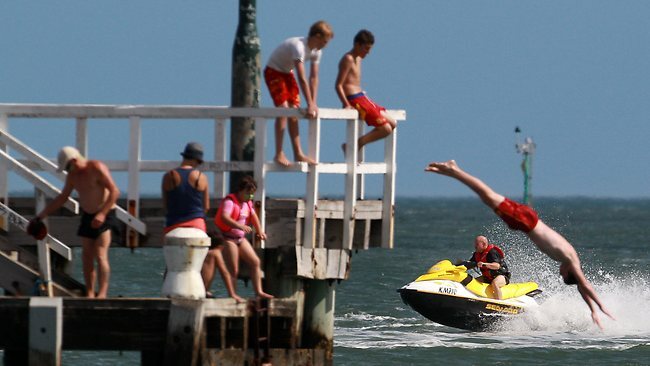 However, a Jetski hit a swimmer recently, who later died in hospital. The exact circumstances have not yet been verified, but is possible the collision happened in the protected area that stretches 1.2 kilometres from Lagoon Pier to Kerford Road Pier. This tragedy and will certainly have repercussions for policing with respect to regulations for water craft 200m from shore and in proximity of swimmers. 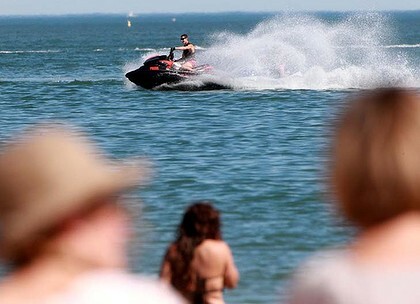 There are even calls for Jetskis to be banned on Port Phillip Bay, as they have been on Sydney Harbour. In addition, a helmet cam video taken by a windsurfer recently records a near miss with a Jetski a long way out in the Bay. One would think the Jetski rider could see a windsurfer its sail, which begs the question as to whether he came so close deliberately. Here is the video footage. You can see the Jetski very nearly hit the windsurfer. Keeping out of No Go zones. There was a nice 20 knot sea breeze on late in the day. Launched at Port Melbourne, far from the madding crowds. Two tacks on the Sector 60 and I was past the pier, one more tack could have got me to St Kilda! I think I could have even got to Elwood. Still amazed at the upwind capability of this board. I had a breakthrough on my first turns. I did a successful gybe to the right (my strong turn) followed by my FIRST successful gybe to the left! Woo hoo! I headed to St Kilda and did some nice speed runs into the flatter water behind the breakwater, faster than all the twin tips and surfboard kiters who were out. 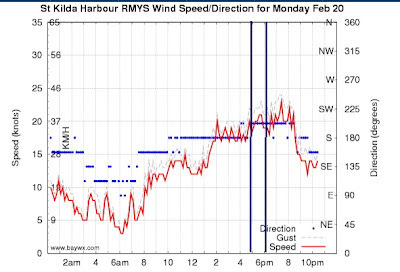 The lower wind behind the breakwater made gybing much harder though. I did a ripping speed run back toward Port Melbourne, then quite a few runs in the bay surf and some more gybes. It is great to be making some progression. I consolidate my riding toeside after the turn, then bring my rear foot forward, and can now ride with it placed there. I am paying attention to keeping pressure on the new front foot, then bringing the other foot back. Relax if the feet are not in the foot straps. Get comfortable and then slot them in later. Loosening the front foot before the turn helps get it out later (this is essential). Commit to moving the forward foot back. Overall, a great session with good wind. I made several successful gybes which was very satisfying. No tech today - it was nice to be just out there. Cruising in 15 knots on the Sector 60 - stoked! Late in the afternoon a 15 knot southerly came in so I headed for Hampton. There were about 5 pole dancers (windsurfers) out but no kites, and a few people on the beach. I pumped up my Noise 12m and got out quickly on my Sector 60 board. What a blast! 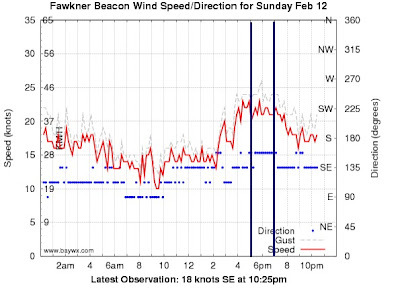 Only 15 knots yet with my 12m kite the board was zinging along and going upwind like a demon! This board can really extend the wind range you can kite in. Its incredible to fly upwind in a wind strength you would otherwise struggle in. It was going so well I even had to sheet the bar out a bit! Gybes were harder though as the board slows down more. I was also conscious of not crashing the kite. Two tacks took me to the breakwater, then a couple more took me out further, then the wind dropped a lot. 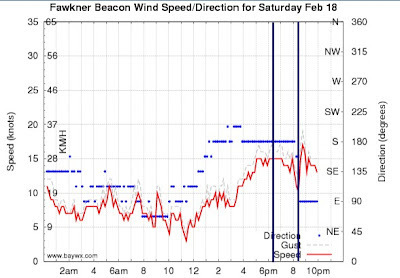 I powered up and raced downwind, with speed of the kite creating enough apparent wind to keep me going fast. On the final downwind tack to shore the wind dropped further. I only just made it in with the kite landing gently on the beach. It was really nice to have a solo session out into the setting sun. The water was warm and clear, it was peaceful and quiet and the session was nice. Life is good. It seemed like an eternity since I last kitesurfed. Later or Sunday a sea breeze stronger than the forecast came in. It was south east so I headed for Mentone. It was overcast, and remembering that I got cold during my last session, I donned my 3/2 wetsuit, even thought it is still summer. Sunglasses are a great accessory for kitesurfing. They reduce glare from the water, protect you eyes from UV damage, increase your comfort, and provide some protection from water spray. You can help support this blog, and my kitesurfing handbook, by buying some excellent Sea Specs sunglasses at a nice price from my online store. Postage is free to Australian residents only. The more you buy the more you save. I think it is well worth having at least a pair of Jet Specs and Sunset Specs. You can pay securely using PayPal or a credit card. Marvellous wind at Mentone and my first GYBES! The task today was gybing (jibing). I took out the Sector 60 and was immediately having fun. The wind was good and the water was clean (despite pollution warnings). I attempted some gybes and got around to toeside but fell off when I tried to reposition my feet. Sometimes I got my rear foot forward, but lost balance and fell when I tried to bring my front foot back. I let the kite get too low too. The BINGO - I did my first gybe! It was on my strong side, from left tack to right tack. It felt great and I am not sure exactly how I did, or what I did differently. Bringing the rear foot forward and getting it straight into the foot strap certainly aids stability. I got around to toeside on my weak site (from right tack to left) but then just fell of the board. I crashed my kite hard on one attempt and tangled the linemount a bit so I headed back downwind to the beach and landed my kite after grabbing another kite while mine was in the air. The line mount was bent back but not broken. I took it off and stashed in it my bag then headed out again. Going upwind so easily on the Sector 60 is quite an experience. I did some small jumps off waves on the way out too. These felt OK but I am wary of doing a big jump and landing hard. I succeeded in completing a total of 4 gybes this session - all on my strong side. This was very pleasing, but I have a way to go yet to gybe consistently. The balance is very tricky. After nearly 2 hours it was time to come in. 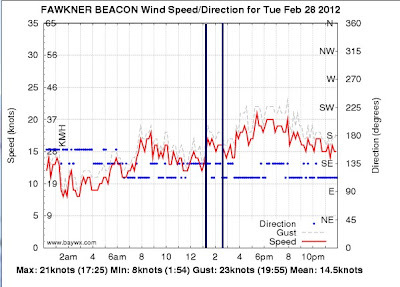 I did some really nice fast downwind runs - the Sector 60 really screams down the bay swell. A sea breeze was forecast and blowing at Hampton this afternoon so I headed down late in the day. It has been nice to rest for a few days, but cabin fever was starting to set in after over 10 days off the water. I met Stuart at the beach and we joined about 6 other kiters already out. I took out the Switchblade 10 as I was on the Sector 60; most other kites were 12m or bigger. I had no trouble getting some good speed and going upwind. It was lovely to get on the water again. My task for today was to practice jibing. I tried quite a few, and actually managed to do two successful jibes - the first ever. However, I was not able to consolidate my feet and ended up coming off the board anyway. Jibing is hard folks. It is as hard to learn as getting up and going the first time, or maybe even harder. Get feet reset in foot straps. No good (twice). I fell numerous times bringing the front foot back. Its an unstable movement. The board sometimes jetted away (weight too far back) or I just fell off. Videos of this make it look easy, but let me tell you: it is hard. Turning from the right tack to the left was even harder. I need to practice toeside riding on the left tack. I get around OK but tend to lose speed and fall back into the water. The Sector 60 board is great to use. It goes upwind so well that I get plenty of practice doing jibe turns without losing too much ground. I did some fast runs in, but the GPS seems to be reading some errors for the maximum speed, which is annoying. Stuart tried the Sector 60 board at the end of day and was surprised by how well it went upwind, and said he found it quite stable too. I may have logged my fastest speed to date of 52.6 km/h, but I am not sure about this given the obvious errors in some of the speed data. The wind speed was around 15-20 knots. So the Sector 60 board handles lighter wind very well, even when used with a size smaller kite than normal. 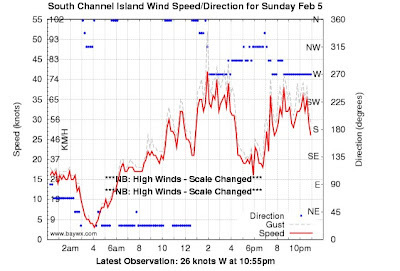 A strong and gusty northerly blew most of the day in Melbourne. 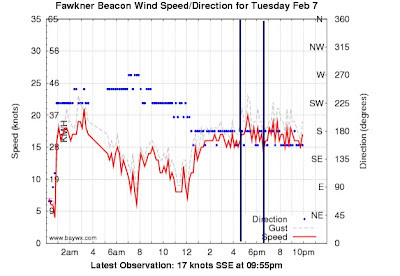 The wind speed at Fawkner Beacon was often around 30 knots, gusting up toe 45 knots. When the forecast westerly came in at 3:00pm there was a massive gust over 50 knots. A kitesurfer (at Rosebud beach in Port Phillip Bay) got caught in this and was lofted onto land, breaking both ankles and possibly suffering some spinal damage too [link]. This accident highlights the dangers of kitesurfing during storms with fronts coming. 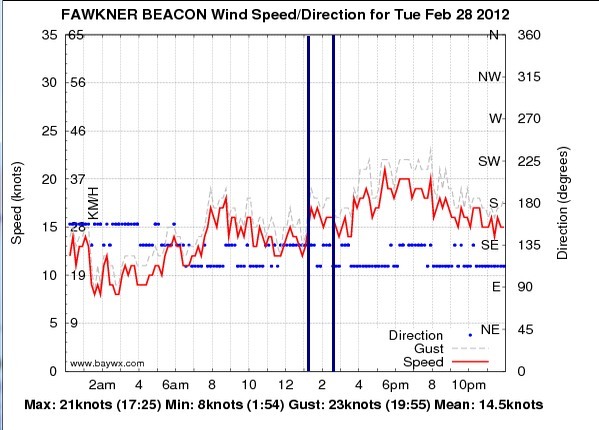 I have provided more information about this here: Kitesurfing storm fronts (Kitesurfing Handbook). We were watching the wind, but the BOM weather radar showed major fronts with heavy rain coming through so we decided not to go kiting. 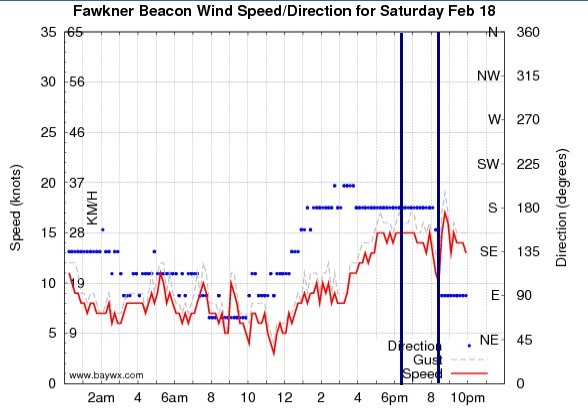 You can see the huge gust that came in with the westerly wind change on the South Channel beacon wind plot. 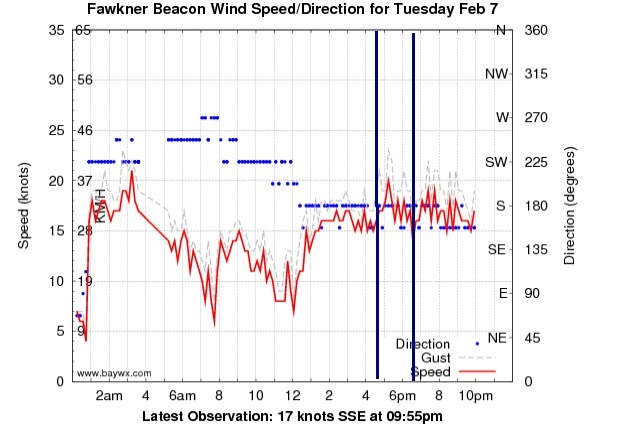 It peaked at 55 knots, which would have been very difficult to handle with even a 7m (or smaller) kite.